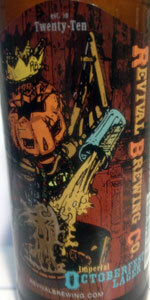 Home Beers Revival Brewing Co.
Revival Imperial Octoberfest | Revival Brewing Co.
King of the Night Creatures, and all things sweet and sticky, this bitter sweet Imperial-style fest-bier is a beer fit for creatures of the night. Brewed with ambition and honed to break style guidelines, this beer demands respect of it's court and rules the taste-buds of it's subject's with and balanced hand. Appearance: Medium amber gold with a thin whitish head that fades to a nice spotty lacing. Smell: Bready malts and nice hop aroma with a bit of spice. Nice piney hops and a some citrus as well. Taste: Hoppier than expected with a traditional marzen flair. Nice earthy components and bready character. Mouthfeel: Medium bodied and crisp, would be perfect on an Autumn day. Drinks well with perfect carbonation. Overall: A fantastic oktoberfest despite the fact I'm drinking it a bit out of season. Worth a try if you can get it! Sean Larkin continues to prove he's the Neil Peart of Brewmasters. This is an Oktoberfest with a bit of an attitude. T: Sweet and malty at first, a touch boozy in the middle and finishes with a crisp hoppy bite. M: Like the girl next door in a dirndl , medium bodied and will go down easy on a fall afternoon. O: I really dig this beer and it's what every American Oktoberfest should strive to be. A surprising marzen. It appears a little more on the golden side of a standard marzen, but the head fades a quicker leaving a small amount of lacing. Aroma is underwhelming, with only hints of hop rather than a heady sweetness of this style. Taste is more bitter than expected of a marzen. The hop leaves a smooth aftertaste but leavesg a heady and thick feel in the mouth. Being an Imperial Lager, this is where the heft makes itself most noticeable. Overall it is quite drinkable, though is outside the model of a your usual Octoberfest lager. It was a dark beer full bodied with a bitter taste almost like a IPA. I was expecting something a little smother but it was very good. Different by very good. I recommend a pairing of something salty to go with it. All and all I say if you like IPA's with a little hint of pumpkin spice. Go for it. Pours a clear brilliant golden orange color with little head. Filmy collar with a few traces of lacing. Toasted grain, sweet caramel and bread crust in the nose. Malty and lightly sweet with a hint of warmth. Leafy hops, hint of pear and citrus. Caramel, bready sweetness on a sturdy backbone. Toasted grains, bread crust and a snap of warmth on the finish. Fuller medium body, well carbonated, crisp and clean on the tongue. Solid, drinkable, refreshing marzen with a slightly boozy kick - I'd be interested in trying more from these guys. Revival Imperial Octoberfest from Revival Brewing Co.